The Village Zendo is a community of people in New York City who practice together in the Soto Zen tradition. They offer instruction, dharma talks, retreats, workshops and more at their lower Manhattan sanctuary. CiviEvent is used to register for events, both paid and free. CiviMember and CiviContribute allow the Village Zendo to collect dues online using PayPal as their gateway processor. The Village Zendo was seeking support while upgrading from an older version of WordPress. They had been using FileMaker Pro for event management, but the WordPress plugin used to display their events on the front-end was no longer supported or maintained. They decided to start with a fresh WordPress Theme, which we built to match their specified design. We also implemented a new plugin to display events – Event Organiser - that integrates very well with CiviCRM. The project itself was straightforward and went smoothly. However, after launch the email address for the Village Zendo’s PayPal account changed, which caused the payment processing to fail. Tadpole investigated and was able to apply the necessary patch to CiviCRM to keep the payment gateway functioning and their income flowing. The priority for the client was using CiviCRM Event module to improve their event registration process. They quickly determined that CiviCRM would be equally beneficial for managing their memberships and donations, too. 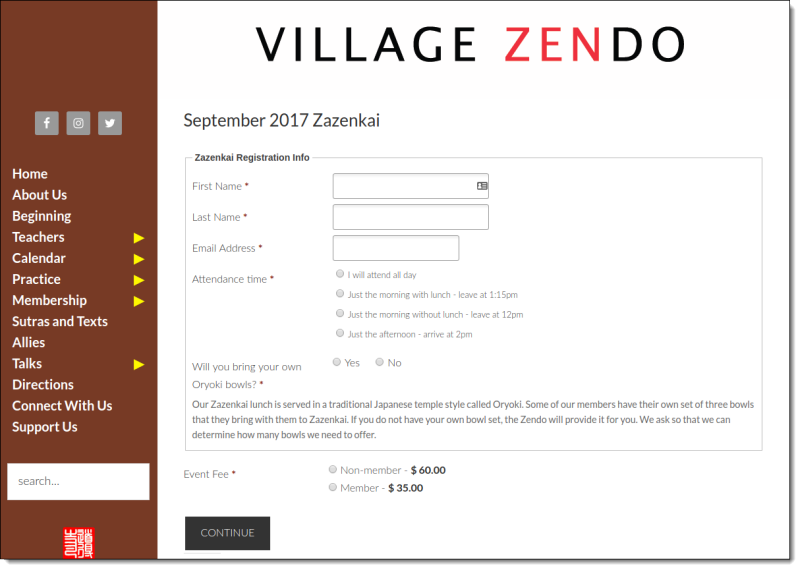 Tadpole was able to help Village Zendo merge and streamline their organization processes, using the power of CiviCRM.